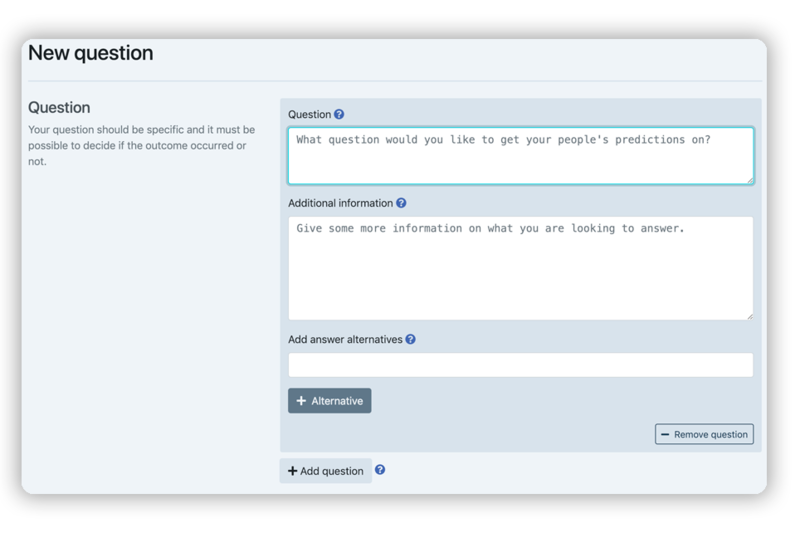 Gather, track and intelligently aggregate your people's predictions in an easy, effective and fun way. We are on a mission to help organizations make better decisions by leveraging the knowledge and insights of their people that otherwise would not have been utilized. 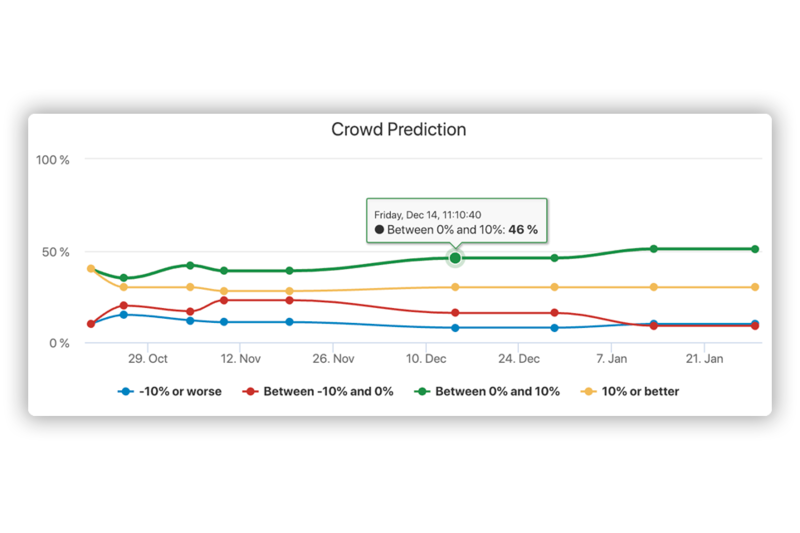 Our software will identify the most accurate forecasters in your team and use smart aggregation algorithms to produce the best forecast. You can then use this knowledge when making decisions. 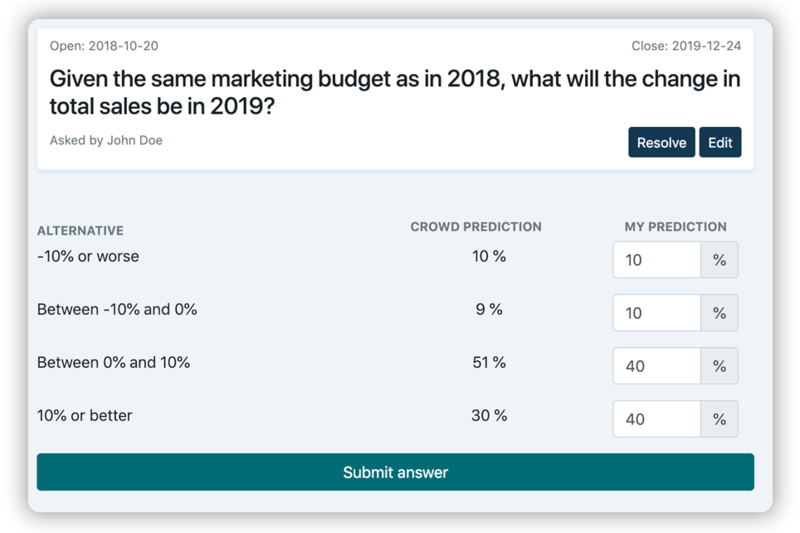 Our software will aggregate answers from people in your organization in a smart way to give you the best possible predictions. 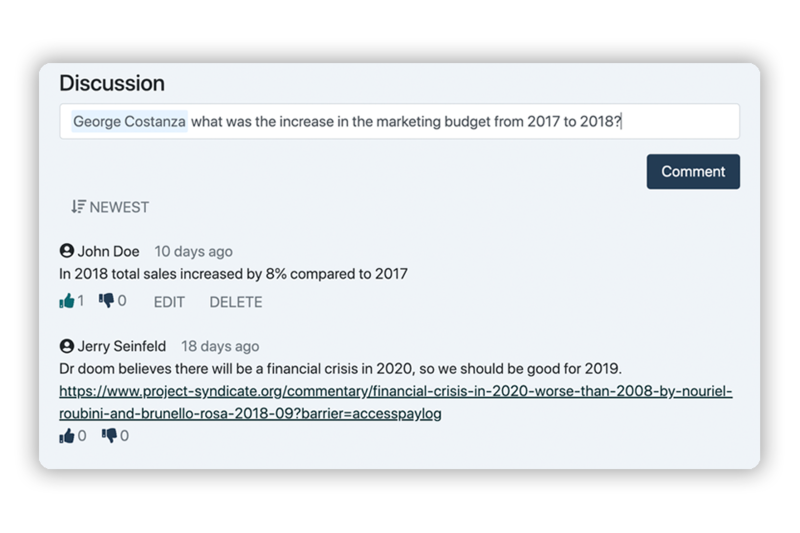 What are you uncertain about that you would like to get your people's best insights on? Leveraging their unique view on the situation, your colleagues give their best estimates. They can update any time. Using finely-tuned algorithms, you get an improved probability estimate based on the latest individual estimates. Now that you have a clearer view of the future, you're in a good position to make decisions. There are numerous operational and strategic decisions that will benefit from using a better and more rational decision-making process. 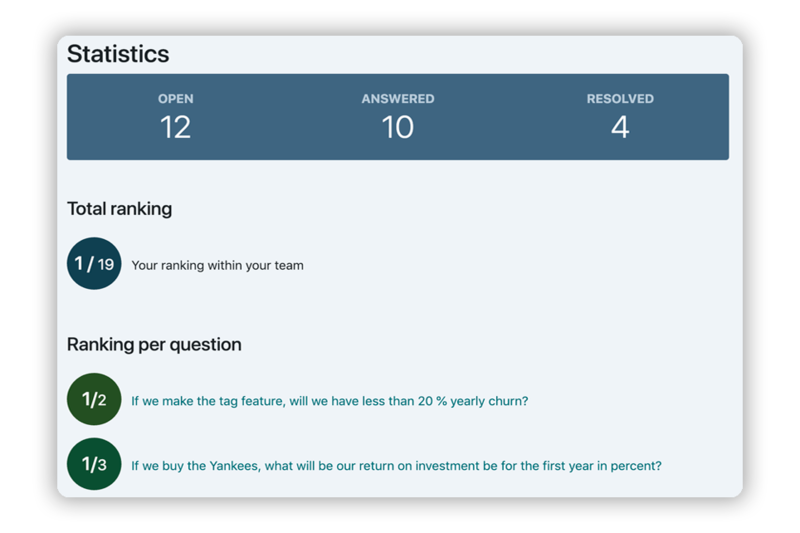 Will our conversion rate increase by 10% or more within one month after we release the new design? What is the probability of finishing the development project by June 15 2019? Given the same marketing budget as in 2018, how many units will we sell in 2019? If we merge with Acme, will our profits in 2019 be at least 10 % larger than the two companies' combined profits in 2018? What is the probability that our final deliverable will be accepted by the client? Will the share of total traffic from mobile phones to our site exceed 50 % of total sessions by the end of 2019? The total cost of our new headquarters is estimated to be USD 100 Million. Within what interval will the costs be with 90 % probability? If we double the frequency of one-on-ones between managers and direct reports, will a smaller share of employees quit or be let go in 2019 than in 2018? Will Tom in the marketing department finish the 2019 London Marathon? Getting people to use a new system can be hard. Empiricast is built with the objective of being intuitive and easy to use for everyone in the organization. Why is this better than just talking to people? Smart algorithms aggregates individual predictions in the optimal way and assignes weights to different participants prediction based on their previous performance. 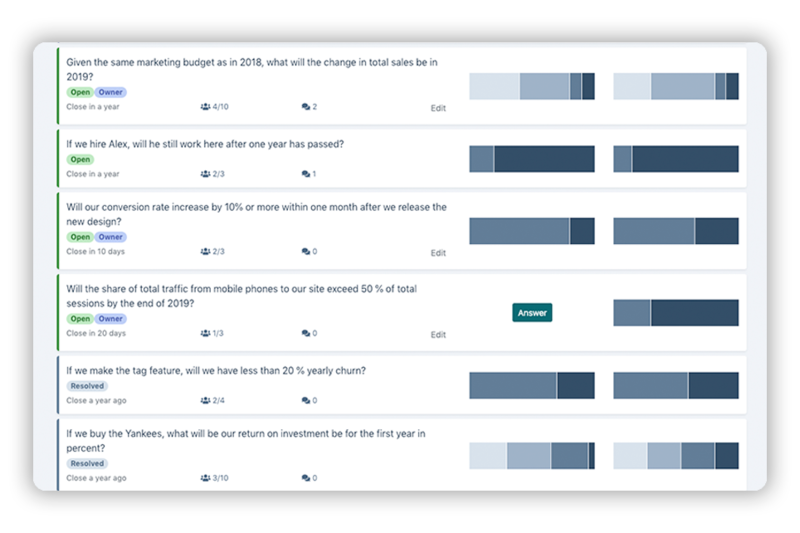 Participants can update their predictions anytime in reactions to new information. Ensuring that all relevant information is captured in the estimate. Total and individual performance is evaluated after each prediction. 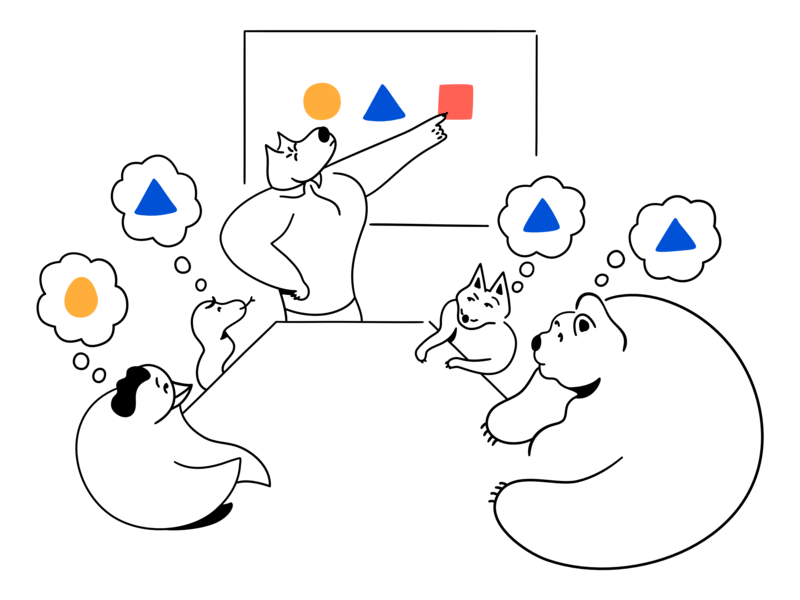 This information is then applied to automatically update and improve the prediction algorithms. We would love to hear from you. Send an email to hi@empiricast.com, call +47 458 04 565 or use the form below.